The Taiwan major FA product agency executive officers participated in Mitsubishi new product training seminar. 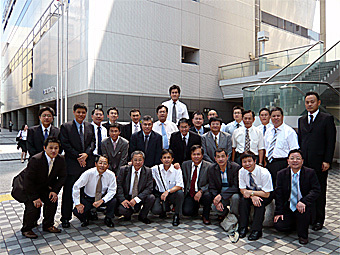 Japan, July 22-25, SETSUYO ENTERPRISE CO., LTD. attended major FA product agency executive officers to participate in Mitsubishi new product training seminar. In Taiwan market where customers timely require more new spec and product, so they have to train their own skill to deepen customer’s knowledge for Mitsubishi FA product. In Himeji they studied “FX3G series” the Next generation micro Sequencer, in Nagoya about control system, they studied “CC-Link IE” the Next generation FA product, IQ-Platform corresponding CPU and display panel GT16 series, about driving system, they studied easy and word-wide standard FR-D700 series, Linear Servo product. After this seminar, we continuously keep on trying to be the No.1 FA products supplier in Taiwan where customer’s needs and demands are getting harder. Taiwan, June 17-20, SETSUYO ENTERPRISE CO., LTD. held the new product “CC-Link IE” seminar at Tainan, Kaohsiung, Taichung, Hsinchu four big cities. With the announcement of “CC-Link IE”, director Tanaka and Mr. Kusunoki from CC-Link Partner Association (CLPA) took part in this seminar as instructor. They reported latest CLPA’s activity, and introduced a concept and a characteristic of “CC-Link IE”. “CC-Link IE” is the system which presents an open Ethernet based integrated optical network concept. It realizes saving the cost of Ethernet cable & connector, 1Gbps high speed transmission, linktimescan 5ms (14times speed). In Taiwan, there is excellent demand for high-speed network FA product from mainly FDP industry and a semiconductor industry. They expect Taiwan is the place where will lead an FA product to tomorrow. 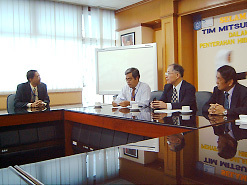 Jakarta, February 5, 2008, supported by Mitsubishi Electric Corporation Overseas Marketing Group, we held the presentation ceremony of Q-PLC series, (the Factory Automation products of Mitsubishi Electric Corporation) at Institute of Technology Surabaya. In this presentation ceremony, many dean class people of Indonesian engineering system universities participated and the media (television and newspaper) reported the ceremony on a large scale. 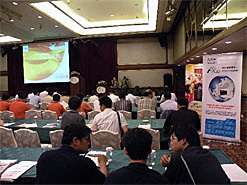 It can tell that Indonesia people have a high interest in industrial automation with FA products. ITS is one of the most promising engineering system universities. 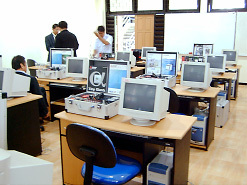 We have already supported Institute of Technology, Bandung with Mitsubishi FA training system. We continuously support to train Mitsubishi FA product specialist who can promote industrial automation in Indonesia. India, January 18-25, 2008, the greatest electronics show was held in India Mumbai. This show started in 1990 and became the 8th time in this time. The number of exhibition companies exceeded 1000 companies to be the greatest ever, and visitors were 100,000 people and roaring business all members. This is the 3rd time Participation of our company following 2004 and 2006. Our company exhibited a high frequency and optical product, a LCD panel, a power module of Mitsubishi Electric, a capacitor (Hitachi AIC), and a control switch (SEIKO) for switchboards, and joint exhibition of the products which mainly made for the inverter kit. 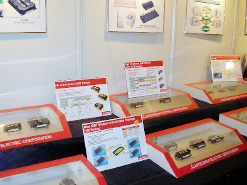 Our company captured the spotlight as the only Japanese company in this exhibition, exchanged many business talks with customers, and finished the electronics show exhibition for five days for useful purpose. 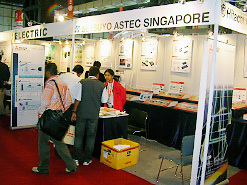 In India, the sales office of SETSUYO ASTEC SINGAPORE PTE. LTD. was installed in Delhi late in 2007. We will have a new office in Bangalore this year 2008, and it will be considered as the launch pad for the India market capture.